Supplying water service to Juniata County! 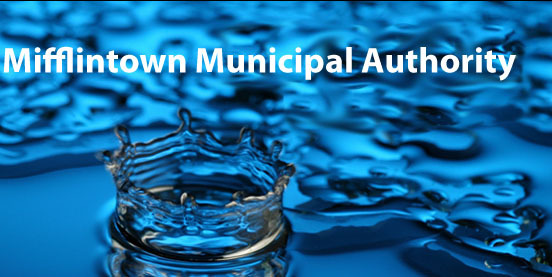 The Mifflintown Municipal Authority serves approximately 4,450 residents and businesses in the Mifflintown and Mifflin areas of Juniata County. In the United States, we drink very little of the millions of gallons of water that are treated every day. Generally speaking, less than 1% of the water produced by water treatment facilities is actually used for drinking. Though indoor water use statistics vary from family to family and around the country, they average out pretty reliably. Did you know that 26% of water used inside the home gets flushed down toilets; 20% is used in showers and baths; kitchen and bathroom faucets use 15%; cleaning and washing dishes consumes an additional 3%; the laundry room uses 23%; and leaks claim 13% of the water used in the home? Studies show that indoor water use can be reduced by almost 30% with water-efficient fixtures, dishwashers, and clothes washers. View our conservation page for ideas on how to help reduce your water consumption and save money too. Check out our event calendar to find out what we have planned such as meter readings, hydrant flushings, and scheduled maintenance. Copyright © 2009 Mifflintown Municipal Authority. All rights reserved.